(Bloomberg) -- America’s journey to preeminence in the global oil trade is about to hit another milestone. 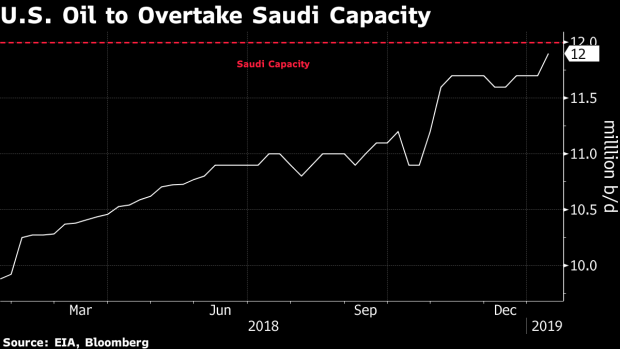 At the moment, Saudi Arabia could raise production all the way up to its maximum capacity of 12 million barrels a day, surpassing the 11.8 million daily barrels produced by the U.S. in December, according to the International Energy Agency. Soon even that won’t be enough. American crude output is poised to expand by 1.1 million barrels a day this year, according to the IEA, which sees the U.S. exceeding the Saudis’ maximum level within the next six months. --With assistance from James Herron.